As the first partner of the ACTUATE consortium, Salzburg AG (SAG) has successfully trained all of its 273 trolleybus drivers in safe eco-driving. An immediate before/after comparison, which was part of the ACTUATE training sessions, showed that more than 90 per cent of all drivers were able to cut down energy consumption (by 20 per cent on average) by applying safe eco-driving techniques. In regular service (with passengers on board) SAG expects energy savings of around 5 per cent. With a software solution developed by ACTUATE partners SAG and Cegelec (a supplier of electrical equipment for trolleybuses) it is now also possible to measure the energy consumption for each individual driver during the training sessions. In addition to all drivers, 39 SAG employees from management, vehicle services and the depot who possess the appropriate driving license participated in the ACTUATE trainings. With this approach a strong support for the ACTUATE project across all departments at SAG is ensured. After a successful pilot phase, the safe eco-driving trainings for trolleybuses were introduced as mandatory training sessions according to Directive 2003/59/EC in February 2013. Before implementation, all training materials were reviewed and validated by ACTUATE partners from Eberswalde (BBG), Brno (DPMB) and Parma (TEP). 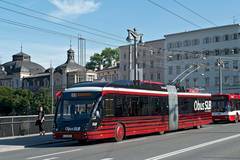 Since February all 273 trolleybus drivers in Salzburg have successfully participated in a seven hour training, with half of the training being a practical driving part on a regular service route (without passengers) in the city of Salzburg. As a feedback survey shows, more than 90 per cent of SAG trolleybus drivers rate the overall quality of the ACTUATE training as either ‘excellent’ or ‘very good and 89 per cent regard the topic of safe eco-driving as ‘very important’ or ‘important’ for their daily work. Especially the practical part of the trainings received very positive feedback by the drivers and is regarded as highly effective.